Film cameras are popular with serious photographers who prefer the detail, color accuracy, and exposure latitude offered by film. This, coupled with greater natural saturation, lets photographers produce outstanding results without the need to spend hours editing their work. Common cameras include 35mm, medium format, and large format cameras. Photos taken with fine grain 35mm film have a similar resolution to those taken with semi-professional DSLRs. Those taken with medium and large format cameras have greater detail, and enlarge well without exhibiting noticeable grain. A 35mm film camera is around the same size as a similar digital camera, and it offers like features such as easy handling, interchangeable lenses, built-in light meters, and robust construction. There are two options: rangefinder cameras and SLRs. Medium format film cameras are larger, heavier, and work best on tripods. Their picture format varies from a square 6 x 6 centimeters to 6 x 9 centimeters, as well as various wide-angle and panoramic formats. Thanks to the larger negative, equivalent focal lengths are longer. A 100mm medium format lens is equivalent to 43mm on a 35mm camera. Large format cameras accept cut film sizes of 4 x 5 inches or larger. 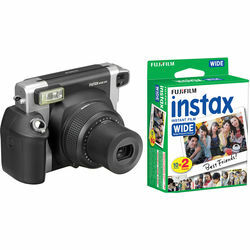 The camera comprises of a film holder, body, bellows, and adjustable slides, and it uses lenses with built-in shutters. Pictures are composed using a ground glass screen and a film back attached for shooting. Swing and tilt mechanisms increase depth of field and prevent distortion of vertical and horizontal planes. These cameras are capable of spectacular pictures. At the other end of the scale are pinhole cameras. Using large format film, these comprise of a light-tight box with a film holder at one end, and a small, finely machined hole that acts as a lens at the other. Although simple in concept, pinhole cameras produce great results. 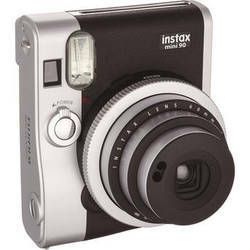 Using similar technology to the Polaroid camera, instant film cameras are still popular thanks to their ability to produce photographs instantaneously. Models range from low-cost disposable cameras to sophisticated units with auto exposure control and auto focusing, as well as manual shutter and aperture control that produce high-quality photographs. Cameras that take film are still very much a part of mainstream photography, and their analog capabilities compare well with the performance of their digital counterparts. Find the right film camera and accessories at B&H Photo and Video.